The Serra EVE Petite system provides a personal hygiene and discreet disposal facility for the female cloakroom. The system is based upon the provision of a tidy yet durable grey (or white) coloured ABS bin, which is placed just behind or inside the toilet cubicle where it fits neatly compactly next to the WC. 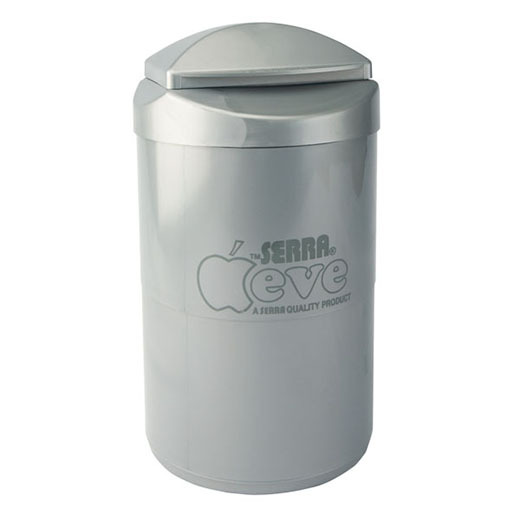 The attractive and modern Serra EVE Petite unit eliminates the inconvenience and embarrassment of outmoded and costly sanitary disposal methods. As mentioned, the provision of the Serra EVE Petite system eliminates the problem of blocked drains and unpleasant smells as well as preventing the spread of harmful bacteria and possible infection. The stylish Serra EVE Petite sanitary bin system meets specific female washroom needs and stringent hygiene standards. From an aesthetic, convenience and especially from a privacy point of view it is important to place the bin inside the toilet cubicle. Placing of the unit outside may encourage other unrestricted waste and litter disposal usage, e.g., paper, cigarettes, etc., for which it is not intended.